With two thirds of the season gone, Hartpury can consider their progress with a great deal of satisfaction. 99 league points out of a possible 100 is already a remarkable achievement and the team will need to lose more than half of their remaining fixtures for the chasing pack to have any chance of running them down. One thing for certain, however, is that as we approach the sharp end of the season, teams across the league will be scrapping for every point, as was the case in this fixture with a determined Hull Ionians. 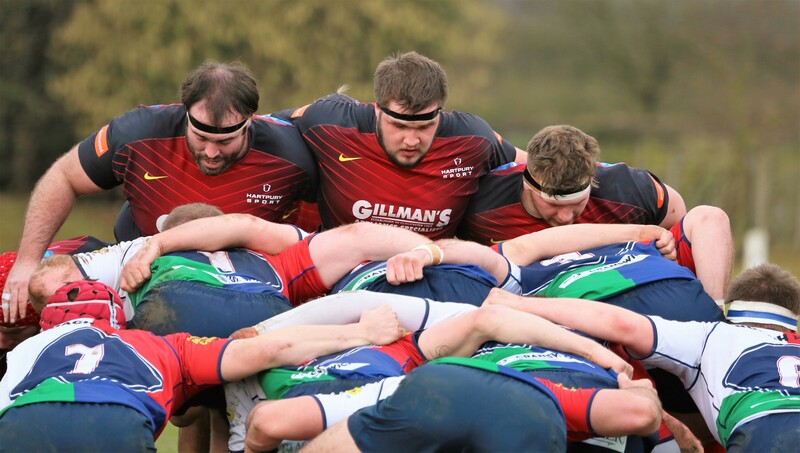 The Yorkshiremen currently sit close to the relegation places, now reduced from three to two following the recent demise of London Welsh, but they made the league leaders work hard for every point in a fixture that was not fully settled until deep into the second half. Ionians’ position may be slightly misleading, based on a number of narrow defeats to some of the higher-placed clubs, and there was plenty in this match to suggest that they have the capability to survive. Hartpury came into the fixture on the back of an uplifting performance against Coventry the previous week, in which they had dispelled some of the lethargy that had crept into their post-Christmas performances. Steve Leonard was still missing from the 13 shirt, replaced on this occasion by Ellis Abrahams, making his second appearance of the season, but other changes were largely based on squad rotation. Harry Randall, named this week in the England Under-20 squad, was a tailor-made replacement at scrum-half for the absent Ben Vellacott while the industrious Ben Chan, who had a fine all-round game, was back for Joe Batley, who was also needed by Gloucester. Prop forward Josh Ibuanopke, at 135 KGs the biggest player ever to pull on a Hartpury RFC shirt, made his debut from the bench. The game started badly for the hosts who lost stand-in skipper Laurence Cowen, to what appeared to be a serious injury, with only two minutes on the clock. He needed lengthy attention on the pitch and, when play eventually resumed, Hartpury drove a lineout from fully twenty-five metres for the first score, Mat Gilbert getting the final touch. Jacob Perry struck the conversion, the first of seven in a faultless performance from the kicking tee. Faced with such adversity, other sides might have folded early but Ionians, to their immense credit, fought back. They got their reward when centre John Allott got hands to a somewhat predictable Hartpury pass in midfield and raced away to score under the posts. Before the quarter was up Hartpury were ahead again and there was an echo of the Coventry game as flanker Jake Polledri stormed through the Ionians midfield to put centre Luke Eves in for a try. That was the end of the scoring in the first half as Ionians enjoyed long spells of possession without ever threatening the Hartpury line, while the visitors’ occasional attacks lacked a killer finish. Hartpury appeared a lot more focused on their return from the changing rooms and immediately started to ask more questions of the Ionians defence. A number of the forwards had made powerful carries before, in the 45th minute, Randall spotted a gap on the fringe of a ruck and was through it in an instant. He comfortably had the pace to finish, under the posts, from 25 metres. Still Ionians remained stubborn and the final quarter had arrived before Hartpury put the game to bed. Another long-range lineout drive was heading for the Ionians line when it was dragged down, leaving referee Jamie Leahy no option other than to award a penalty try. Minutes later, Polledri capped another strong performance with a powerful hand-off as he went over for try number five. Jonas Mikalcius, closely marked, had been experiencing a frustrating afternoon but he made amends with two tries in the final five minutes. The first came when he had the power and the pace to get outside the Ionians cover, while the second saw him claim a nicely weighted Perry kick before getting around and behind the posts. Hartpury next welcome Blaydon to the college, before a challenging trip to second-placed Ampthill in a fortnight. Ionians: Minikin, Wilson, Humberstone, Allott (Try 14), Smith, Irvine, Green (Con 14); Laverick, Forth, Stout, Cotterill, Eggleshaw, Poole, Sanderson, Cowen. Replacements: Johnson, Thomson, Pardo, Boxhall, Rees.